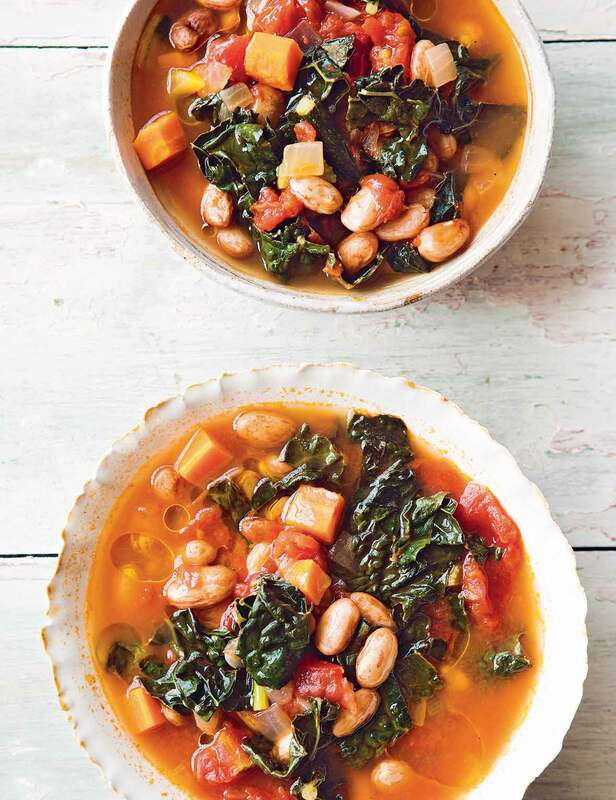 Tuscan bean soup is a classic Italian vegetable soup that just happens to be loaded with trendy super foods such as kale. Seems the Italians have known what’s best all along. 1. Pick over the beans and toss out any stones or unrecognizable grit. Rinse the beans thoroughly under cold running water and drain. Dump the beans in a large bowl or stock pot and add enough cold water to cover by 3 to 4 inches (7 1/2 to 10 centimeters). Soak the beans for at least 4 hours and up to overnight. 2. Drain the beans and dump them into a soup pot. Add enough cold water to generously cover the beans. Bring to a boil over medium-high heat and then reduce the heat to low, cover partially, and gently simmer until the beans are tender, 1 to 1 1/2 hours. 3. Drain the beans, pouring their cooking liquid into another pot or a heatproof bowl. Set aside both the beans and the liquid separately. 4. Heat the olive oil in a stock pot over medium-high heat. Toss in the onion, carrot, and celery and sauté until the onion and celery are translucent, 5 to 7 minutes. Meanwhile, separate the stems from the kale leaves. Stack the kale leaves, roll them up lengthwise, and then cut the leaves crosswise into strips about 1/2 inch (12 millimeters) wide. Discard the stems or save them for another use. Toss the kale in the pot and cook, stirring frequently, until wilted, about 5 minutes. Add the garlic and sauté until fragrant, about 1 minute. Pour the tomatoes into a bowl and, using your hands, crush them into small pieces. Add the tomatoes and their juices to the pot and stir to combine. 5. Measure the bean cooking liquid and add enough water to measure 4 cups (32 ounces or 1 liter). Add the beans and the cooking liquid mixture to the pot along with the bay leaf and red pepper flakes. Bring to a boil over medium-high heat, reduce the heat to medium-low, cover, and simmer just until the beans are heated through, about 10 minutes. Season to taste with salt and black pepper. Ladle the soup into warmed individual bowls and serve right away. This hearty Tuscan bean soup will serve you impressively as a complete dinner with a crusty hunk of bread. If I don’t have a vat of soup stashed in my fridge at all times for a quick snack or a meal, then I simply must make one. And that’s exactly what my situation was when I put this one to the test. Everything about this recipe, including the amounts and timing, proved to be fairly accurate. Although this vegetarian soup can definitely stand alone, I just can’t pass up the opportunity to add sausage to a bean soup. So after I dutifully performed the requisite testing and tasting, I tossed a couple sausage links into the pot and simmered for 10 more minutes. Then I removed the sausages, sliced them, and added them back to the pot. Other tweaks included dusting the top with a generous blanket of Parmesan cheese. I enjoyed this soup with a crusty rosemary roll, and it made me think that this soup could benefit from a branch of fresh rosemary tossed into the mix. (Next time!) It makes quite a large pot, so you will likely have delicious leftovers for lunch the next day. Delicious, simple, and nutritious. That's pretty much all I have to say about this soup. Cooking the kale for only 10 minutes with the beans and liquid was too short for my taste. The leaves were still very tough and "raw." I cooked them for an additional 20 minutes to get them perfectly wilted and softened. They never got mushy but were slightly firm and fully cooked. I think if this is served as a main course, it makes close to 6 servings. It keeps very well. I enjoyed the last of it almost a full week after I first made it. It is great as is, but adding a drizzle of olive oil and long shavings of Parmesan took it to another level. Eating this soup took us back to Italy, where we first had—and fell in love with—Tuscan bean soup. We ended up ordering it every day, even though it was summertime. This recipe did not disappoint and will be made and enjoyed often. I cooked the beans in a pot with a couple of the Parmesan rinds that I keep in a bag in the freezer. The broth was very flavorful. I ended up with 6 cups bean broth, 4 cups of which were used for the soup and 2 extra cups that I froze. In the hour it took my cranberry beans to cook, I prepped the rest of the ingredients. I cut the stems out of the kale and sliced them into 1/4-inch-thick pieces. I added the sliced stems to the chopped onions, carrots, and celery, and sautéed them all together. I cooked everything in the pot the beans had cooked in. All times were accurate. The soup is delicious as written. After eating some of this soup simply, I served the rest the way that we always enjoyed ribollita. I made crostini from a baguette, put it in the soup bowls, and added the soup. I drizzled a lovely, peppery Tuscan olive oil over the top and a sprinkling of Parmesan cheese. Che buono. Delizioso! This is the perfect soup for a snowy evening! This comforting soup was a hit with a big pan of cornbread. I used cranberry beans, and they were tender in 1 1/2 hours. They held their shape and were just tender to the bite. My bean cooking liquid was approximately 3 cups, so I added water to make 4 cups. The soup was really full of vegetables. I think next time I would add an additional 1 cup water or broth to the soup. The soup was full of flavor and deliciously healthy! I'll definitely make it again. This is a great soup. The ingredients are simple, fresh, and a great combination. The recipe works as written and produces a hearty soup that tastes like so much more than the sum of its parts. The beans can be soaked overnight and cooked in advance. This makes for a quick evening meal in about 30 minutes on a busy weeknight. The soup did need a significant amount of salt. As the temperature drops, we all like to have something to warm our bellies, and there's nothing better than a hearty soup, right? Well, this Tuscan bean soup definitely fits the bill. It's very easy to prepare and is just like nonna made. It can be a warming appetizer or a meal by itself with some crusty Italian bread. Borlotti, or cranberry, beans can be found in most supermarkets. I soaked them overnight. The pepper flakes can be to taste but are an important ingredient—I used 1/4 teaspoon, which didn't make it hot but imparted a subtle hint of spice. I de-stemmed the kale and gave it a rough chop and followed the recipe from there. I served this as a first course to guests, and they raved about it, so I have additional tasters that want the recipe. The times in the recipe are accurate but your temps can vary. Just taste as you go and you can't go wrong with this one. It can be frozen for the future or kept in the fridge for leftovers—just add a bit of water or broth if it's too thick. This is for sure going on my winter soup lineup. This recipe is a keeper. After cooking the beans for 1 1/2 hours, they were tender and ready to eat. As the vegetables were cooking, I chiffonaded the kale, ending up with close to 6 cups, although of course once the kale cooked, it wilted down. The cooking liquid needed about 1 cup extra water, but I used chicken broth instead for additional flavor. I'm not sure that 10 minutes in the pot is enough time for the bay leave to extract any flavor. A pinch of basil, tarragon, thyme, or all of them would add more dimension to the flavor. As a meal, this will serve maybe 4 people. Tuscan Bean Soup Recipe © 2014 Dana Jacobi. Photo © 2014 Erin Kunkel. All rights reserved. All recipes and photos used with permission of the publisher. Your Tuscan bean soup is a classic. 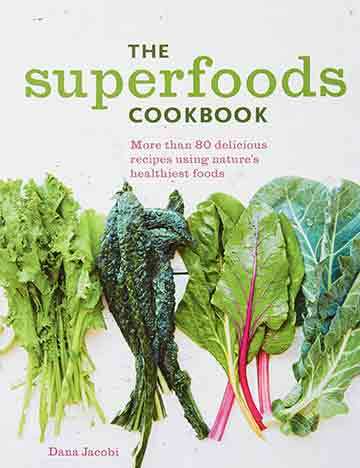 When I make it, I use an immersion blender to puree the solids before the kale, then afterwards I put in the kale. I am lucky here in Minneapolis, Minnesota, in so far as we have a wonderful grocery store which sells baggies of Parmesan cheese rinds for soups. I boil the rinds with the broth before blending, then I remove the “spent” rinds. I had this soup in 1996 at Trattoria ZaZa at the Piazza Mercato Centrale, in Florence. I sat on a “seat” made of a tree stump at a communal table and had trie zuppa, three soups, served in a babies three segmented serving dish with hot water keeping each segment hot. One of the soups was Ribollita…and I fell in love with all things Italian at that instant. I have 2 single-quart containers of the soup in my freezer as I “speak” to you now. Love this blog. Lovely, Stu. Just lovely. Thank you for taking the time to share. Very helpful (and hunger-inducing) comment. Oh gosh, many thanks, Victoria! How lovely to hear. Thank you for taking the time to say so.